During either player’s turn, when a card or effect is activated that includes any of these effects: You can discard this card; negate that effect. ● Add a card from the Deck to the hand. ● Special Summon from the Deck. ● Send a card from the Deck to the Graveyard. You can only use this effect of “Ash Blossom & Joyous Spring” once per turn. A card that stops everything. Gee I wonder why this card made it to #1. It probably wasn’t even close. Despite how I grappled between Drident and Ash Blossom & Joyous Spring, I knew in the end there was one distinct difference. Drident is gone and banned, and Ash Blossom is still with us, and probably for a while. Much like Maxx “C”, it’s hard to justify restricting or banning a control card that doesn’t further ridiculous combos. Even though everybody and their mother is running as many copies of Ash Blossom as possible, all she really is and was meant to be is a card to keep things in check. Slow the game down a bit. So she’s prevalent, but not ban-worthy until she’s truly worn out her welcome and occupied too many decks over the course of time. But that’s what makes her #1. She’s everywhere and she won’t be stopped by anyone, not even Konami. And with maximum future potential, that’s what you truly want to see in the best card of the year. Well I wasn’t going to miss the best card of the year. It should come as no surprise that the card in every deck is number 1. Ash Blossom & Joyous Spring is a Level 3 Fire Zombie-type Tuner Monster with 0 Atk and 1800 Def. Basically, during either player’s turn, you can stop a crucial effect from going off. Solemn Warning is limited for a similar reason. That reason being, it’s just too good. Warning can only be stopped by other Counter Traps. At least this monster can be Striked if need be. Every deck does at least one of the effects that Ash Blossom negates. Every. Single. One. Then, It’s also a Tuner. I’d be interested to see what Synchro Monsters were intended to go with these tuners, if any. I’d also be interested to see a champion not running this and the corresponding reason why. Happy New Year! Keep Enjoying Yugioh! I would of been stunned and astonished if Ash Blossom & Joyous Spring was not number 1. The card from Maximum Crisis, which actually had the same number of mentions as Raging Tempest on this list, is the best hand trap in the game today. What a card for the final review of 2017. Ash Blossom is a Level 3 Zombie Tuner, Fire attribute, with 0 ATK and 1800 DEF. The ATK is bad, but the DEF is ok. Level 3 is one of the best levels for a Tuner, Zombie is a great type with many benefits, and Fire doesn’t really offer much sadly. 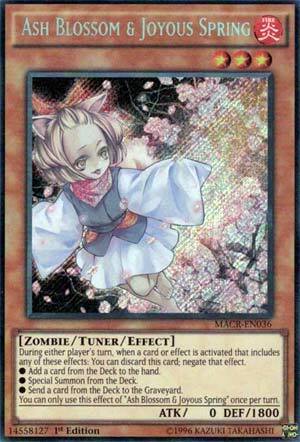 Ash Blossom is a once per turn hand trap which negates cards that adds a card from the deck to the hand, send a card from the deck to the GY, or summons a monster from the deck. Almost any meta deck will have searching, Foolish Burial effects, or summoning from the deck. Ash Blossom can literally slow your opponent’s plays down or potentially even stop their plays as a whole. The best hand trap in the game for a reason, almost every deck should be running three, as every deck should have one of the three effects this card can negate. Ash Blossom & Joyous Spring ranks #1 for 2017 Yu-Gi-Oh cards on Pojo.com. This is one of the best hand traps in the game and I’m surprised that it hasn’t been touched on the ban list, even if it helps other players against the more powerful decks, its power to turn a game should be noticed. Ditch to stop an effect that either gets a card to the hand from the deck, Special Summons from the deck, or sends a card from the deck to the grave is play-breaking power that can’t really be touched from the hand (minus a Solemn Strike). Follish Burial gets stopped, any searcher from the deck to the hand is stopped, and any searcher that Special Summons from the deck. Yes it’s a one-for-one and it only negates and doesn’t destroy the card that does the effect, but searchers are likely being sent to the grave and not staying on the field. Even if they remain on the field, like something around Armageddon Knight, you still stop what they are setting up. Ash Blossom doesn’t have really anything in terms of being a monster on the field, but you could still use her as a Tuner, a level 3 one at that, for a Synchro Summon, or even a Rank 3 Summon, but you are likely keeping her in the hand. Search her with Sangan and be ready next time your opponent comes up. That, or just wait to draw her, either way, you’re locked and loaded to negate with her in the hand.